I love movies - I like new ones, old ones, cult classics, foreign movies - I like them all, give me a good summary that interests me and I'm game. Even better is when I can watch the movies on a big screen. Movie theaters are expensive and I try to pick up gift cards from the local theaters when I can via holidays, birthdays and point gathering sites like My points. Then I can go to the theater for free. However, a lucky day comes along on occasion where I don't need to have a gift card and I can go to the movie theater for free or a couple of dollars. Every Summer the local movie theater chains have summer kids movies for cheap and I always fine a couple on the list that interest me. I have already verified with the theaters that it is ok if an adult comes w/out a kid. Regal Theater has a free family movie festival starting in June through August - Selected G & PG movies start at 10AM each Tuesday and Wednesday during the festival. Check the state selector for any theaters in your area. AMC Theaters bargain movies aren't free, but for $1 I can give to charity - All admission proceeds from AMC Summer MovieCamp will benefit Variety – The Children's Charity and the Will Rogers Institute. Their movies are twice a month during the summer. One very cool benefit to the apartment complex I live in, and one no one uses, is the 70+ inch screen that I can watch dvd rentals on. 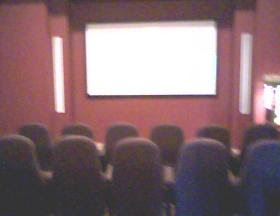 I get the movie theater seats that I eactly want (chuckle), I can pop my own popcorn, and I can bring my own drink, and have some friends over to see a movie off the big screen, and have a day in the dark watching movies I've rented. 1. The Library - new releases, old classics, documentaries and foreign films are all here. 2. Swapping w/ friends - One of my co-workers always buys his movies, never rents and he is kind enough to let trusted friends borrow them. 4. Online Movies - Websites like Hulu offer movies free, documentaries can be found at places like Snag films among other free video sources. And if you feel technical enough, you could hook up a laptop to the tv set and watch it on a bigger screen. 5. Movie subscriptions - I'm not a big fan because I always seem to get the scratched ones, but if you have a subscription through Netflix or Blockbuster you can easily rent movies for 2.50 a piece or cheaper, depending on your subscription plan. Overall, when you really think about it, you can see some pretty great movies for a cheaper price than $4 for PPV or $5-10+ at the theaters. It just takes some planning and a big bite of patience. I really recommend people to use the local DVD rental shops than purchasing the DVD as this can save them lots of money and if they want to watch the movie again then they can save the movie on their computer and attach a cable to watch movie on their LCD TV. I do know there are dvd/vcr players. Are there any players which play each of those dvds and blu-rays that I can get rather than shopping pair of different players?